"Just thought I should share this sobering update. I have noticed lately that Mom seems thinner and she is often sleeping when we stop by. I checked with the nurse and she said that Mom is not eating much. Most of the time they have to feed her to get her to eat anything, although she does have days where she does a little better. The nurse said this is what to expect since she is in the end stage of the disease, and added that she would be surprised if Mom made it to summer. Of course she also expected Dad to go a good year before he did, so it is just a guess on her part. Still, the nurse got my attention. I always kind of thought their deaths would come in close proximity. I am sure that somewhere inside Mom's poor tangled self, she misses her lifelong companion and is ready to go." Dad died late last November, having made it past his 95th birthday. We didn't tell Mom. After he spent some time in the hospital for hip surgery and pneumonia, when he came back she regarded him with suspicion and no longer seemed to retain that last bit of connection that had outlived the departure of almost everything else she ever knew, including the names of her children and how to speak English. (I dubbed her speechlike vocalizations "Klingon," a nickname that stuck among all the Star Trek fans I grew up with.) She can't retain or fully comprehend anything we say to her, and if she could, why give her even that passing moment of pain before the new information vaporized? 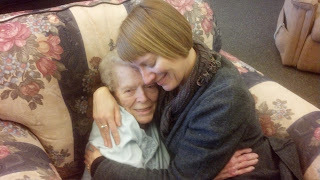 After Dad died we moved her into a smaller single room at the care facility and she began to retreat into herself even more. When I got my sister's email I laid plans to get to Lewiston for a visit. Not exactly for Mom, since she doesn't know who I am, although she brightens when she sees me. They're sort of for me--a fulfillment of a sense of duty to the mother who did such a good job for so many years even though that woman packed up her bags and left a bit at a time, years ago. They're definitely for my older sister, who has borne the brunt and who can skip a visit if I make one. Over the past few years I've felt lucky that I usually got a good visit. "Good" meant that Mom was awake, seemed happy to see me, and might even occasionally get a phrase or sentence out in the midst of the Klingon. The last time I was down for a visit to see Dad a few days before he died, with my older daughter and her husband accompanying us, at the lunch table Mom brought out quite clearly, "Aren't we having fun!" with a pleased expression. We heartily agreed that yes, yes we were. My visit this Monday is one I'll cherish. She looked at me a bit uncertainly when I arrived and said to her, "Hi, Mom, it's your daughter here to visit!" She asked quite clearly, "Who am I?" "You're Gladys Greene, and I'm your daughter," I said, squeezing in alongside her on the big upholstered chair she sat in facing the TV, where a very young Clint Eastwood confronted the judge in Hang 'Em High. "Buh--" she began, looking at me and raising her eyebrows questioningly. "Yes, I'm Barb," I answered, thinking that she really did seem to be trying to get my name out and had the right linguistic association. She smiled and began telling me something in Klingon. Thanks to Second Daughter pointing out years ago that one could interact with her quite smoothly by simply ignoring the meaninglessness of the words and responding solely to tone of voice, facial expressions, and body language, I'm pretty fluent in our interactions. I smile, nod, provide verbal filler like, "Oh really!" or "I see" when she pauses, and generally go with the flow. As my friend Maggie said years ago about visiting her mother-in-law who had Alzheimer's, "You're going to a foreign country and observing the culture. It isn't your job to try to change them--you just use good manners, thank them, and then come back to your country when the visit is over." Mom seemed worried about something. She went on at length in Klingon and then asked me something like, "How did you manage all those people?" I said, "Oh, it went all right. It was fine." She didn't seem convinced. "When was this?" she asked. "A couple of weeks ago--a while ago," I answered. The phrase "a while ago" seemed to get stuck--she couldn't repeat it back and puzzled over it, and was still worried about whatever it was I'd done with all those people. I leaned forward, put my arms around her, patted her back, and said, "It's all right. It will all be okay." Immediately I felt her relax into my arms as her arms went around me in return. She gave a deep sigh, then another. I rocked her a bit, holding her and patting her back. She pulled back, looked at me, and said, "Thank you very, very much." I leaned forward and wrapped my arms around her again. Victoria, a South African aide I hadn't met before, stopped by our chair and asked if I wanted her to take our picture--I was so glad she did. We stayed like that for 20 minutes or more, mostly silent. Every once in a while she gave a little start--perhaps that falling sensation that gets you when you're falling asleep was happening--and I'd pat her back again and tell her it was all right. She would relax again. I got tears in my eyes more than once as we sat together, holding each other. I realized how little loving touch she receives any more and how important that is. She is assisted, moved, bathed, and more by very nice aides, but they have to handle her in a very clinical fashion. With Dad gone there isn't anyone there every day to give her hand a squeeze or make eye contact and smile with something passing between them. When it was time to leave I eased my arms out from around her, told her I needed to go, and kissed her on the forehead, telling her I love her. She yearned toward me--I could see it in her expression--and I stroked the side of her face. She sat with eyes closed, absorbing my touch. I didn't want to go. It makes me smile just thinking of how contented we were, holding each other. It was the best visit ever. Don't Buy That Case of Stuff on Sale. I'm Serious.